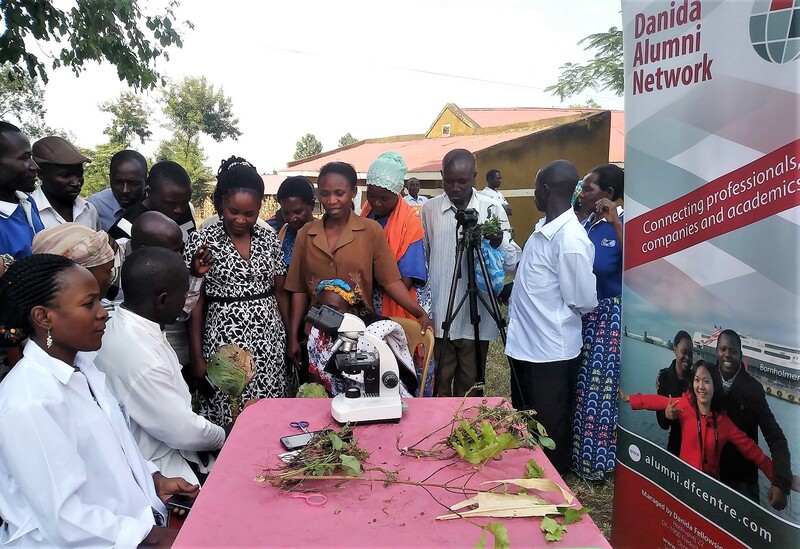 In the following you can read about the results achieved by Danida alumni through the activity grants they were awarded by Danida Alumni Network earlier this year. Following the call for applications for Danida Alumni activity grants, a team from the Danida Alumni Network-Ghana (DAN-G) received funding to organize a science and technology seminar for 56 young girls and their teachers in collaboration with College of Science of the Kwame Nkrumah University of Science and Technology (KNUST). The pilot seminar was aimed at both teachers and students of the Ayeduase R/C Junior High School with a goal to generate interest in Science, Technology, Engineering and Mathematics (STEM) and increase the enrolment of girls into these programmes. The parallel workshop for teachers was intended at building their capacity to effectively mentor and guide their students towards reaching their academic and professional objectives. Different speakers at the event agreed that the seminar was of great importance since very few girls choose science as their academic path. Professor Ibok Oduro, explained that science has been mystified and is generally perceived as a subject reserved for boys. Another keynote speaker, Dr. Nana Ama Browne Klutse, senior research scientist at the Ghana Atomic Energy Commission, explained how to make science attractive to girls. She emphasized the gender disparity in STEM programmes, outlining the root causes, the way forward and the opportunities ahead. She encouraged the girls to empower themselves by saying “I am a girl, I am smart, I am strong and I can do it”. This eventually became the slogan of the seminar. Besides Professor Ibok Oduro and Dr. Browne Klutse, the Danida alumni had successfully invited many other guests and speakers among them Ghana's Deputy Minister for Environment, Science, Technology and Innovation and the Pro-Vice Chancellor of KNUST. Initial steps to continue the collaboration between the KNUST and Ayeduase R/C Junior High School have already been made and you can read much more about the seminar, results and the way forward the report here. Ghanaian TV also covered the event and you can find the video here. The science seminar in Ghana was not the only activity, supported by Danida Alumni Network, to take place this summer. In Uganda Danida alumni launched the Rwenzori bi-annual Danida alumni plant clinic. More than 70 farmers brought sick plant samples for examination and treatment. The Danida alumni offered the farmers advice on how to prevent and control the presented diseases. The crops that were brought for consultation were mostly; coffee, banana, maize, cassava, beans, cabbages and ground nuts. In Kathmandu Danida alumni organised a workshop about the role of Nepalese universities addressing the issues of the sustainable development goals. The purpose of this workshop was to hold an interactive discussion where Nepalese Universities and other stakeholders could discuss the current position of Nepalese Universities in contributing to the issues of quality education and gender equality, its challenges and possible solutions. RCE Greater Nairobi (RCEGN) with the support from the Danida activity grant hosted a climate change awareness meeting in Nairobi on 26th June 2018. The meeting targeted formal, non-formal and informal organizations from both the private and public sector, Non-Governmental Organizations affiliated to the RCE and Danida alumni. The objective was raising awareness on climate change issues and sharing possible solutions with one another. Another grant was given to a networking event and workshop organised by Danida alumni and the University of Nairobi’s African Women Studies Centre. The event was aimed at providing information on how to be a successful business woman and become more economically empowered. Earlier this year we did an article about the work of Danida Alumni Network (Uganda) in partnership with Afrigreen Sustain. With support from the activity grant they very successfully held waste management activities across four schools in Gulu Municipality. You can read much more about the workshops here. We have uploaded the completed activity grant reports to the website, which can be found here.